The news that the UK might finally get an in/out referendum on EU membership by the end of 2017 will clearly have some influence on Scotland’s referendum on membership of the UK. The debate about what would happen to Scotland’s EU membership if we became independent has become a tangled web of claim and counterclaim with an added pinch of deception. David Cameron’s announcement just adds another tangle. The whole issue is surrounded by uncertainty, but it is still possible to reach a degree of clarity regarding the fundamentals of the issues involved. The first thing to realise is that we don’t really know whether the EU referendum in 2017 will happen. At the moment it depends on a Conservative victory in the 2015 election. But if it turns out over the next year or two that holding a referendum is a genuinely popular policy in the UK, it is hard to imagine that Labour will enter the election with the policy of denying the people of the UK a choice on this matter. The likelihood then is that at some point in the relatively near future the electorate will have a vote on EU membership. Whether the people of Scotland take part however, depends on the outcome of the independence referendum in 2014. If Scotland voted for independence in 2014, then according to the timetable suggested by the SNP, we would be an independent sovereign state by 2016. 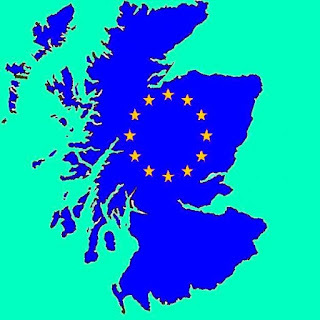 Scotland would remain a part of the UK until 2016 and would therefore remain a part of the EU. We don’t really know what would happen then. The SNP thinks that it would be possible to negotiate EU membership terms immediately after winning the independence referendum. The European Commission however, suggest that the negotiations could only begin when Scotland had achieved its status of being a sovereign state. But here’s another issue of uncertainty. Scotland will take part in the 2015 general election, whether we vote for independence or not. But one of the major themes of this election is clearly going to be a vote on membership of the EU. Would Scotland be denied a vote on this issue, if we voted for independence from the UK? We certainly wouldn’t be taking part in the 2017 referendum as we would already have left the UK by then. Assuming however, that Scotland could quickly and successfully negotiate EU membership, it might be possible that we would be an independent state within the EU sometime around 2016 or soon after. The EU, of course, could be awkward about this, especially as the Spanish and perhaps the Belgians would want to discourage secession, but on the other hand they might try to reward Europhile Scotland in an attempt to discourage Euroscepticism in the rest of the UK (rUK). However much we speculate about this issue, in the end we can not really know what sort of deal an independent Scotland would get from the EU or how quickly it would occur. But during all this time that Scotland would be negotiating the terms of its EU membership, rUK would be trying to renegotiate the terms of its membership. How successful rUK might be in its negotiations is likewise hard to judge. It depends fundamentally on whether the EU wants Britain to remain a member of the EU or not. If David Cameron could renegotiate rUk’s relationship with the EU, such that rUK was part of the single market, but not much else, he would have a good chance of winning a referendum in 2017. If on the other hand the EU decided that such a semi-detached relationship was incompatible with membership of the EU and only offered token changes to membership, it is likely that the Eurosceptic people of rUK would vote to leave. However it is worth remembering that any deal, which was obtained by rUK would not apply to Scotland. The whole nature of the relationship between Scotland aspiring to join the EU and rUK threatening to leave is quite different. Moreover, rUK would still be one of the big three powers in the EU, while Scotland’s population and economic size, would rank somewhere alongside countries like Denmark or Slovakia. A small supplicant desperate to join the EU is unlikely to get the terms of membership, offered to a large member who is seriously considering leaving. It may be, of course, that the EU would try to be tough with rUK, in which case it seems certain that rUK would leave the EU, seeking either membership of EFTA or simply whatever sort of trade agreement it could get with Europe. The result of all this is that in a few years rUK could be out of the EU, while Scotland remained a member. The terms of Scotland's membership could be similar to those which we have today. On the other hand. the EU could demand that Scotland commit to joining the Euro and become part of the Schengen zone. The boundary between an EU country and a non-EU country could hardly be just a sign saying “Fàilte gu Alba”. These sort of things would be determined by negotiations at the time. One thing we do know however, is that Scotland would be joining an ever closer union. We certainly would not obtain a looser relationship to the EU than we have today. Indeed, we would not even be seeking such a relationship. What would be the consequences if rUK were out of the EU while Scotland remained a member. Well, we would no longer have the rights we have at present owing to our being citizens of the UK, nor would we have the rights owing to our being members of the EU, as rUK would have left. Unless rUK chose otherwise, or unless it was constrained by whatever negotiations it made while leaving the EU, Scots would have no more rights in rUK than non-EU nationals entering the UK at present. Furthermore, maintaining a Stirling Zone between an independent Scotland and rUK would be already problematic, even if both remained part of the EU. It would be still more problematic if rUK left the EU. The likelihood therefore is that rUK would be unwilling to maintain monetary union with Scotland. Scotland would therefore require our own currency and central bank. Perhaps, more importantly Scotland would be setting out on a very different path to our greatest trading partner. We would be moving towards ever closer union with the EU, while rUK would be moving in the opposite direction. Whatever we think of the merits of these two paths, they would most certainly lead eventually to divergence between our respective economies. This would clearly damage the single market which has existed in the UK for centuries. This single market is even more important to us economically than the single market which exists in the EU. Under the circumstances outlined here Scotland would have achieved independence in 2014, but would have immediately set about giving up a large part of its newly won sovereignty. In time as the union of the EU grew ever closer, more and more of this sovereignty would be subsumed. Over the past number of years voters in the UK have gradually realised that the parliaments they elect whether in London, Edinburgh, Belfast or Cardiff are limited by a mass of EU law and regulation. The politicians we elect are commonly constrained by EU officials who we do not elect. Our parliaments have lost a great deal of their sovereignty. If rUK were to gain a semi-detached relationship to the EU or leave entirely, immediately their parliaments would regain a great deal of this lost sovereignty. This would mean that what voters chose would be more likely to happen. The independent Scottish parliament on the other hand, would in reality be far less independent than the parliament in Westminster. The achievement of Scottish independence, while simultaneously giving up the sovereignty newly won, would turn out to be an illusion. We, the voters would have remained more independent if we had remained in the UK voting for a Westminster parliament, which once more would be fully independent and sovereign.